See now, shop now, buy now! In addition to The Shows ( 4 fashion shows) the Water Tower Place will also host THE MARKETPLACE. Powered by FashionBar Chicago, THE MARKETPLACE is a boutique, pop-up Fashion, Wellness and Beauty shopping experience that is open to the public Friday, Saturday & Sunday before and during The Shows as presented by FashonBar LLC. Shop the hottest fashions and latest health, beauty and wellness products directly from our designers and vendors. 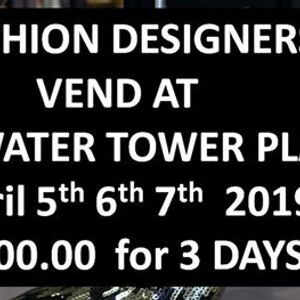 We are in search of Fashion Designers to vend during The Marketplace in the hottest retail area in the City of Chcago...The Water Tower Place.. The veinding oppiurtunity is located in a 16,000 Sq ftt on the 3rd floor of the Water Tower Place. 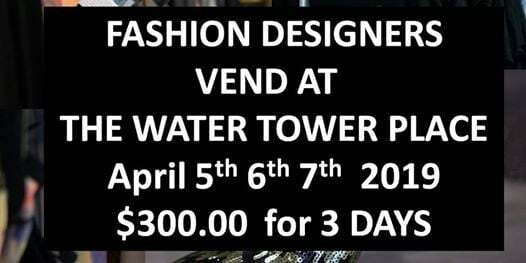 Fashion Designers will vend for 3 FULL DAYS targeting guests and vistors both from attending The Shows, The Marketing and The Water Tower. We provide the table and you bring your racks marketing material, signage and set-up shop!!. This is the perfect oppurtunity to market your designer brand, gain the commerrical exposure and grow YOUR sales! Who will you be Selling too? Who will be marketing too? We will list your brand on our designer particpation list and market The Marketplace to help via a press release to over 200+ Media and press outlets. We will be spocalising this our social medai platform which consists of 30,000 followers (all social media platforms) as well as utilizings efforts from our business partners, spoonsirse etc.. The Marketplace is FREE Admission! (donations accepted for Howard Brown Health Clinic and the VOICES Program, Fashion, Beauty and Wellness as IDENTITY WHO WE ARE! Designers email with your questions: ZmFzaGlvbndlZWsgfCBmYXNoaW9uYmFyY2hpY2FnbyAhIGNvbQ== or visit.